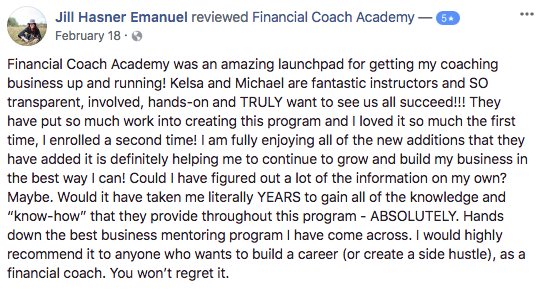 The Financial Coach Academy™ is a 16-week, virtual financial coach training program where you will learn practical, tried-and-true methods for starting and operating your very own financial coaching business. Not only will you gain a proven financial coaching business model but you will also learn advanced financial concepts and coaching skills to help your clients gain control of their finances. The Financial Coach Academy will help you master all three. 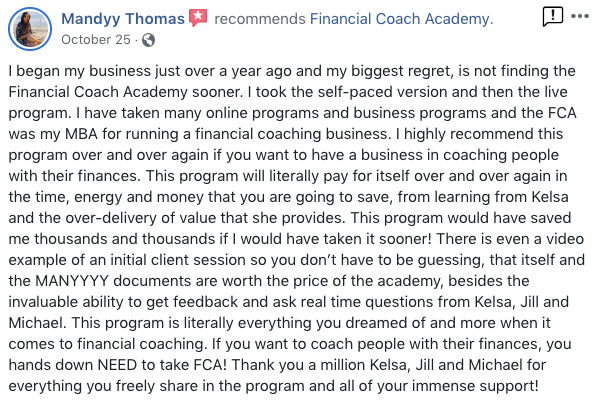 The Financial Coach Academy is currently the only financial coaching program the meets the education requirements set forth by the Certified Professional Financial Coach program. Learn about becoming a Certified Professional Financial Coach here. Ten live online workshops, ranging from 90 to 120 minutes in length. Six built-in execution and mastermind weeks to implement what you have learned, share ideas with others, gain feedback and insights from the team of experts and actively create your financial coaching business. Dozens of recorded ancillary videos by trusted professionals on topics like legal issues for financial coaches, insights from CPAs, software and solutions from IT, best practices from other referral partners, and more. Introduction to and an explanation of every contract, handout, checklist, software, or tool I use to run a six-figure financial coaching business. A private Facebook community to connect and collaborate with your classmates. Mentoring and continuous feedback from Kelsa, Michael and their team throughout the course. All content is released weekly, one module at a time, so you cannot rush ahead or will not get overwhelmed if you fall a week or two behind. Video workshops will be available upon completion of the course, so you can watch them as often as you want. You also will get access to an online suite of files, downloads, contracts, powerpoint presentations, and other content, pre-made for you so you don’t have to reinvent the wheel. You’ll never lose access to the materials in the course! This truly is the best, most comprehensive financial coach training program around! All graduates of the Financial Coach Academy receive a Certificate of Completion as well as a Financial Coach Academy Graduate Seal to place on their website and in their marketing materials. Enroll in the Live Academy TODAY! Only 20 coaches allowed per semester! No live class this week. This is where we put what you’ve learned so far into practice. Mastermind and Interactive mentorship available every week but this is when we really put it all into action! Weekly online modules and coaching video conferences that teach you how to master power partners, client on-boarding, systematize coaching sessions with clients, marketing, overcoming objections, identifying your niche and much more. All recorded so you can watch anytime. Clear out all the clutter and advice you read and get real, down to the details, experienced coaching from a financial coach who puts it to practice every day! Access to the online resource library released with each training call. It includes downloads, contracts, worksheets and other material it took me nearly 10 years to perfect. Imagine all the handouts and contracts it will take you hours upon hours to create on your own, handed to you on a silver platter! Access to an exclusive mastermind group of other like-minded financially, savvy professionals who are on the same journey as you. Weekly live Q&A calls and masterminds to gain instant feedback as you execute all your new ideas! One-on-one feedback from Kelsa, Michael and their team. For the live version of The Financial Coach Academy, the meetings are held online (virtual), meaning you can attend in the comfort of your own home, wherever your home may be. Classes are held on Thursdays where you will join Kelsa and Michael in a private online web conference room using Zoom. For the self-paced version of The Financial Coach Academy, the meetings are all recorded and available immediately so you can watch any where at any time. What’s my ROI? Can you guarantee results? We have put nearly 10 years of hard work into this course. It will show you everything that has brought us success and every mistake that we have made so you don’t repeat them. We truly believe that everything you get out of this course is directly related to the effort you put into it. We will provide ample execution time to be able to apply everything that we teach and are confident that works, plus accountability to keep you motivated and on track. Unfortunately, we can’t guarantee any level of results. What will I learn in the Financial Coach Academy? Practical steps to taking your personal finance advice and knowledge and crafting a business model around it- everything from contracts and pricing to scheduling and marketing). We want you to learn from our mistakes and successes and implement them to create a successful Financial Coaching business. You will also learn tried and true activities that get results with clients- from exercises, discussion topics, handouts, effective questions and so much more! What will I be able to to do with the information I learn from during the Financial Coach Academy? You will be able to take your knowledge and passion for personal finance and turn it into a successful Financial Coaching business that you can build from the ground up. What qualifications or certifications are required to take the Financial Coach Academy? None! Just a passion for helping people with their personal finances! Some people may classify you as a certified budget geek. Don’t worry. We love budget geeks. You will be in good company. What if I can’t join live or I have to miss a class? No problem. All of the live online workshops are recorded and posted in the online training database along with powerpoints for each presentation, worksheets, templates and other forms and files. What do FCA graduates receive to show they’ve completed the program? What are the differences between the live course and the self paced course? The Self-Paced version of Financial Coach Academy gives you all of the recorded lessons, downloads, templates and videos that you would get in the Live Course but at the speed that works best for your busy life. If you are working a full-time job and/ or have a busy family life this might be the best option for you. The only thing that you don’t get is the 24/7 guidance and feedback from Kelsa, Michael, their team and other students concurrently taking the live course. If you are self-motivated, a self-starter and/ or are extremely limited on time this may be the best option for you! We feel the biggest bang for your buck is the live course. It is only available twice per year (Spring and Fall) so timing is the biggest reason people choose the Self-paced over the Live Course. The Live course offers weekly, live, online lessons followed with Q and A and mastermind sessions and also access to the recordings of those sessions for future reference or if you missed the live lesson. It also offers access to the amazingly active Private Facebook group so you have 24/7 online feedback, mentorship, mastermind and accountability with your classmates and instructors. While you get the same lessons and information as the Self-Paced courses, you will have your Financial Coaching business up and running more quickly and completely realized by the end of the course because of the level of support and accountability you get with your classmates and with Kelsa, Michael and their team. Register for the next live session now! Space is limited to 20 people and every round of the Academy thus far has sold out! If your preference is to join the live conversation, do not delay. If you’re interested in taking the self-paced course, you can purchase the course and begin learning immediately! Or if you have questions you can call us at (480) 788-4588 or email info@fiscalfitnessphx.com to set up a discovery session to find out why this program may be right for you. How is your program different from other financial coach training programs? Our program is set apart in a few big ways from other financial coach training programs. 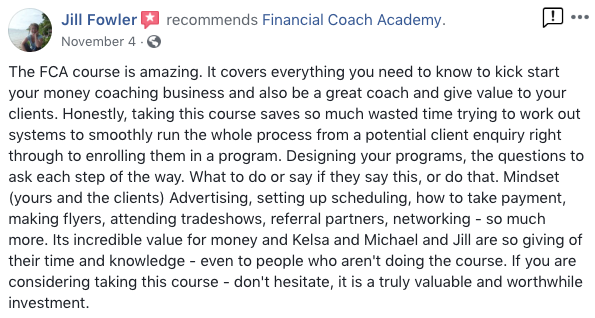 Financial Coach Academy covers 3 main pillars – financial concepts, business building strategies and coaching skills – and we feel our approach to these are top notch! We do not provide theories, we provide practical, hands-on, step-by-step instruction on tried and true methods. We share what didn’t work for us and why. We live and breathe Financial Coaching every day! Our approach to financial concepts, for example, is behavioral and skill-based applications and exercises you can do with clients! We don’t spend time talking about mortgages, bankruptcy, estate planning, insurance or other topics that you are probably familiar with already. We also provide lifetime access to the course materials, so you never lose them nor do we ask you to pay more to keep them. That means as your business grows and you face new obstacles, you can revisit the materials and tackle those challenges with confidence! Finally, not only do we share exactly how we do everything, we also give you the framework so you can create your own strategies that are unique to you! Our goal is that you are inspired and guided by us, not that you feel you need to do it exactly as us. 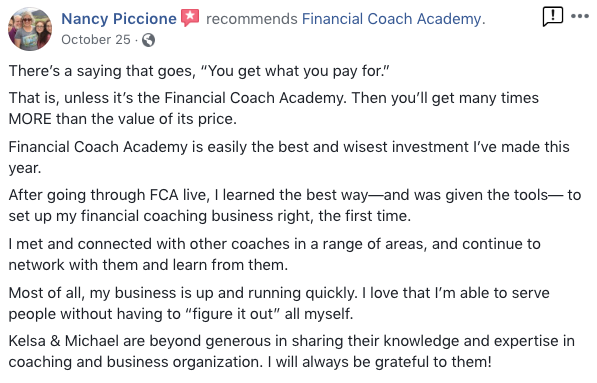 I can say without any hesitation that the Financial Coach Academy is the most comprehensive, thorough, specific and valuable training for financial coaches there is. Do you teach the basics of personal finance? We do not cover specific financial topics (i.e. what is a mortgage or what is interest) because we feel there is already a wealth of great information and training out there on these topics (and we’ll share the ones we like best),. But we assume that by having an interest in the FCA, you know a lot of this already. 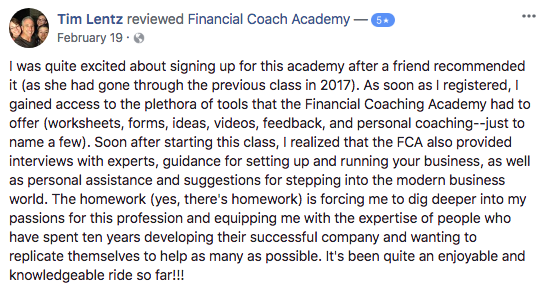 Do I need a degree in finance to join the Financial Coach Academy? Nope, all you need is a desire to help people with their finances and a passion for personal finance. Ready to launch your financial coaching career? Even More Happy Participants & Future Financial Coaches!